In another notable decision, this time in the case of Zauflik v. Pennsbury School District, 1 MAP 2014 (Pa. Nov. 19, 2014 ), the Pennsylvania Supreme Court upheld the constitutionality of the $500,000 statutory cap on tort claim recoveries against local governmental agencies under the Tort Claims Act, 42 Pa.C.S.A. Section 8501-8564. The statutory cap which was upheld is found at Section 8553. In the end, the molding of a jury verdict in favor of the Plaintiff in an amount of over $14 million dollars for personal injuries down to the $500,000 cap was upheld over the Plaintiff's constitutional challenges. The Supreme Court noted that any changes in the law in this regard should originate from the General Assembly as opposed to the court system. 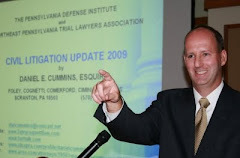 I say thanks to Attorney Matt Keris, the current President of the Pennsylvania Defense Institute and a shareholder in the Moosic, PA office of Marshall, Dennehey, Warner, Coleman & Goggin for bringing this notable decision to my attention.